This article is about the French oil company. For the catamaran sailboat, see Elf Aquitaine (catamaran). Elf Aquitaine was a French oil company which merged with TotalFina to form TotalFinaElf. The new company changed its name to Total in 2003. Elf has been maintained as a major brand of Total. Elf Aquitaine's heritage is rooted among three French oil companies: Régie Autonome des Pétroles (RAP), Société Nationale des Pétroles d'Aquitaine (SNPA), and Bureau de Recherches de Pétroles (BRP). These companies were formed to exploit the discovery of a gas field in Saint-Marcet in the Aquitaine region of south-western France. In December 1965 RAP and BRP were merged to form Entreprise de Recherches et d'Activités Pétrolières (ERAP). ERAP had SNPA, Union Générale des Pétroles (UGP), and Union Industrielle des Pétroles (UIP) as subsidiaries. The resulting company achieved vertical integration, owning assets in all phases of the petrol business from exploration and production to the filling station. On April 28, 1967, the company's disparate brands and products were unified under the Elf brand, Essence et Lubrifiants de France. Elf was the first company to pioneer a completely synthetic racing oil. In 1976 Elf-ERAP merged with Antar Pétroles de l'Atlantique and became Société Nationale Elf Aquitaine (SNEA), later Elf Aquitaine. Elf Aquitaine was listed on the NYSE in 1991. In 1993 Elf was awarded the exclusive contract to the Iraqi oil fields by Iraqi leader Saddam Hussein. In 1996 the French government sold its stake, retaining a golden share. In 2000 Elf Aquitaine merged with Total Fina to form TotalFinaElf, which changed its name to Total in 2003. Elf Aquitaine spent millions of dollars in the 1979 Great Oil Sniffer Hoax to develop a new "gravity wave-based oil detection system", which was later revealed to be a scam, and lost over $150 million. The Elf scandal which came to light in 1994 in France was according to The Guardian, 'the biggest fraud inquiry in Europe since the Second World War... Elf became a private bank for executives who spent £200 million on political favours, mistresses, jewellery, fine art, villas and apartments'. Iraqi-born Nadhmi Auchi, at that time rumoured to be among the ten richest men of Britain, received a 15-month suspended sentence and a £1.5m fine for his involvement taking illegal commissions. Auchi was also linked to the Clearstream scandal. He is BNP Paribas bank's main private share-holder; and until 2001, the money for the Oil-for-Food programme transited through the escrow account of BNP Paribas. Magistrate Eva Joly investigated the case. In the Leuna/Minol deal following German reunification, Elf Aquitaine took over circa 2,500 vacated gas station allottments in the former East Germany without paying the rightful owners. From its very beginnings Elf used motor racing as a means of promotion. It began with a four-year association with Matra in a French Formula Three program. This resulted in Henri Pescarolo winning the title. The European Formula Two Championship fell to Matra the following year with Jean-Pierre Beltoise. In 1969, the combination won the Formula One World Championship with Tyrrell and Jackie Stewart. The goal of winning the Le Mans 24 Hours was not achieved until 1972, by which time Elf and Matra had gone their separate ways. Elf, at that time owned by France, then undertook a policy to rebuild and promote French motor racing. This began a long-term relationship with Renault, which was also owned by the French government at the time. 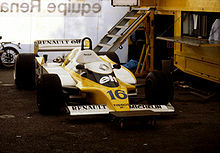 Renault promoted the use of Elf oils in its road cars, while its Formula One racing cars also carried Elf sponsorship. This changed in 2009, when the Renault Formula One cars replaced the Elf logos with Total logos. The most famous of the schemes to promote young drivers dates back to the start of the 1970s, when Francois Guiter of Elf established what was known as the Volant Elf. The fastest drivers on each course at the Winfield Racing Schools, Magny Cours and Paul Ricard, were asked to return to the school in the autumn to establish the fastest driver of the year. The two winners were each given a full budget to race the following year in Formula Renault. If they were fast enough they would be retained by Elf in Formula Three and then Formula Two (or later Formula 3000), and eventually they would get a drive in Formula One. The first two Pilotes Elf were Patrick Tambay and Didier Pironi. Both went on to win Grands Prix. They were followed over the years by Alain Prost, Pascal Fabre, Olivier Grouillard, Paul Belmondo, Éric Bernard, Érik Comas and Olivier Panis, all of whom became Formula One drivers. In addition, Elf often picked up other good drivers and sponsored them, creating a generation of top French drivers in the 1980s and early 1990s. When Guiter retired Elf decided to change the policy and a revised program was implemented. This aimed to create a scheme for drivers, mechanics and engineers. Called "La Filière;" it funded as many as eight drivers each year in Formula Renault Elf Campus and four in Formula Three. Budget cuts between 2008–2012 reduced the number of French drivers moving on to Formula One positions. ^ M. S. Vassiliou (2009). Historical Dictionary of the Petroleum Industry. Historical Dictionaries of Professions and Industries. Scarecrow Press. p. 180. ISBN 0810862883 – via Google books. ^ a b Cohen, Nick. "The Politics of Sleaze". The Guardian. London. Archived from the original on 2007-11-12. Retrieved 2007-12-16. ^ Connett, David (May 4, 2008). "Unwelcome publicity for oil giant in legal battle with billionaire". The Independent. London. Retrieved May 1, 2010.